Dennis 'the non-flying Dutchman, the Dutch maestro' Bergkamp has ended his professional career after 20 seasons of football. Starting in the Ajax youth academy, Bergkamp played several successful seasons in Amsterdam. Together with Wim Jonk, Bergkamp went abroad in 1993. He went for two seasons to Italy where he won the UEFA Cup. Not feeling very happy, he decided to change countries and joined Arsenal in 1995. Dennis Bergkamp became a very popular and successful player at the London club. After a few contract extensions, Bergkamp finally decided to end his career at Arsenal in June 2006. 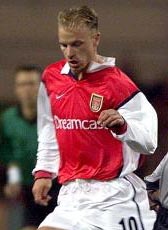 He has played 11 seasons for Arsenal of London. His final match was on the bench in the lost Champions League final against Barcelona. A sad end for the legendary footballplayer.